Save Our Children is an occasional, half tongue-in-cheek “True Crime” series, examining the theological crimes perpetrated on our kids by Christian children's books. The Crime: Implying at that our hearts are more pure than our actions, that God is satisfied with us as long as we “do our best,” and that he doles out blessings according to our effort. 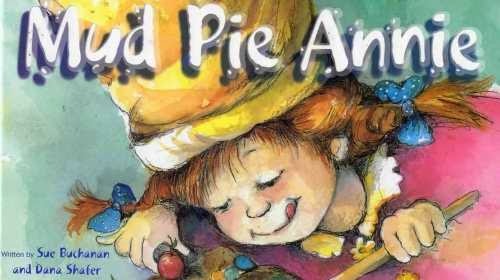 The Scene of the Crime: Mud Pie Annie is actually a very cute book. At the arrest, neighbors said they were shocked that a book so charming could have committed such heinous crimes. Annie is a little girl with a fertile imagination. She fancies herself a chef, but her only toy is a mud hole in her backyard. She makes “zesty mud-pie casserole and muddy remoulade. A roast of mud with mustard, dark mud pudding with whipped cream, scrumptious sweet mud custard, double mud-surprise-supreme.” She calls her neighbors, but they decline to partake of Annie’s meal, as do her parents. Her parents throw her in the bath, whereupon Annie begins to have more cooking fantasies, this time in the bathtub. “No matter what I do in life, I’ll do my very best. and that’s how I’ll be blessed. The Bible tells a very different story than Mud Pie Annie, though the book’s central illustration is apt. We are like Annie, playing in the mud pit, satisfying our own desires -- to the horror of our friends, neighbors, and parents. Unfortunately for Annie, it’s not enough to say that God is happy with us as long as we do our very best. Our very best isn’t close to good enough…only Jesus’ perfection is! Annie is right to say that God doesn’t see the mud between our toes, but the reason isn’t that he’s focused on the beauty of our hearts (he surely isn’t), it’s that our mud has been given to Jesus, and Jesus’ freshly scrubbed cleanliness has been given to us. And even though we can say that God is more concerned with our motivations (our hearts) than with our actions (the mud between our toes), that’s bad news, not good. Our hearts are the source of the problem, not the respite from it. No one can rest in the knowledge that though their actions may be soiled, their hearts are clean. Indeed, their actions are soiled because their hearts are dirty, too. Finally, God’s blessing is given on account of Jesus Christ’s work on our behalf, not on our efforts for God. He who knew no sin (had no mud between his toes) became sin -- and gave us his cleanliness -- so that we might have God’s blessings. Our efforts -- our trying hard -- have nothing, praise God, to do with it. The Verdict: Our kids need to hear that their status -- their blessing -- with God depends not on their effort or obedience, but on the accomplishments of Christ. It’s true that God doesn’t see the mud between their toes, but it’s also true that he’s forgiven the deceit in their hearts.